If art’s mission is to change public perceptions or to transcend established practices, it can no longer be apolitical, unaware of social or economic currents. The creators of an exhibit that examines the “cultural afterlife” of taxidermised polar bears (nanoq: flat out and bluesome, by Bryndís Snæbjörnsdóttir and Mark Wilson) sum up a rather recent shift in our attitudes toward their subject: “During the last decade the image of the polar bear has moved in the public imagination from being an icon of strength, independence and survival in one of the most climatically extreme of world environments, to that of fragility, vulnerability and more generally of a global environmental crisis.” Their latest project, Matrix, focuses on the bears’ maternity dens in Svalbard, “perfectly adapted model[s] for habitat in the arctic environment.” Since the Rodin pupil Francois Pompon’s L’Ours Blanc (1922), the language of polar bear art has changed, as have its approaches. Drawing on wildlife biology and physics research, Snæbjörnsdóttir and Wilson plan to chart any changes in the architecture of polar bear dens that could signal the bears’ adapting to new environmental circumstances, such as shortened winters and poor snow conditions. By translating their findings for a larger, non-academic public the artists hope to inspire contemplation and questioning of accepted knowledge or dogma. 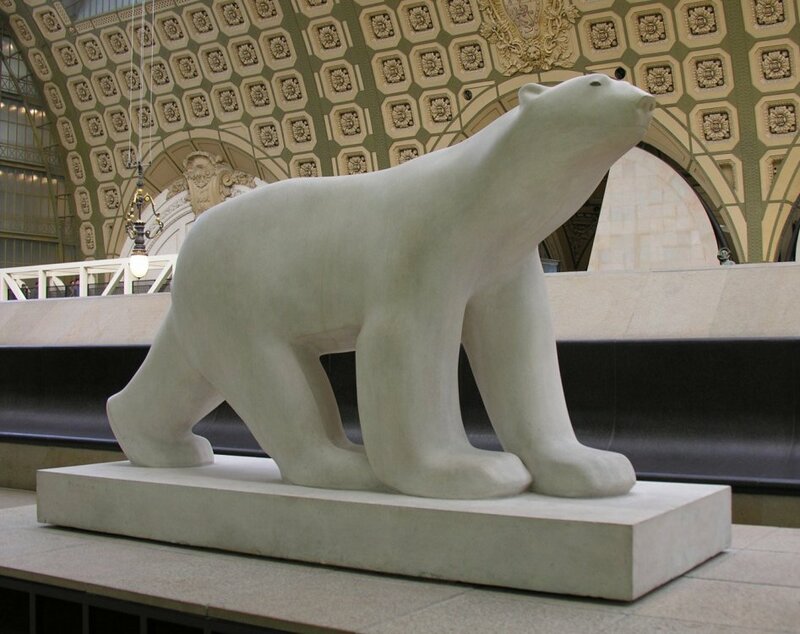 With a different tack and a stronger slant, Ackroyd & Harvey created Polar Diamond (2009) after a trip to Svalbard. For this piece of conceptual art, the duo cremated a polar bear bone, which they obtained, with permission, from Svalbard, and artificially grew a diamond from the ashes. Their work sped up a process that in nature takes millions of years. It questions the price we pay for carbon. Ackroyd & Harvey think their diamond carries “an anticipation of loss, and the knowledge that rarity inevitably increases value.” at of course applies to both diamonds and polar bears: the number of lowest-grade jewelers’ diamonds has been estimated to be in the tens of thousands; polar bears number between twenty thousand and twenty-five thousand. Another conceptual piece deserves mentioning for its unusual fate. 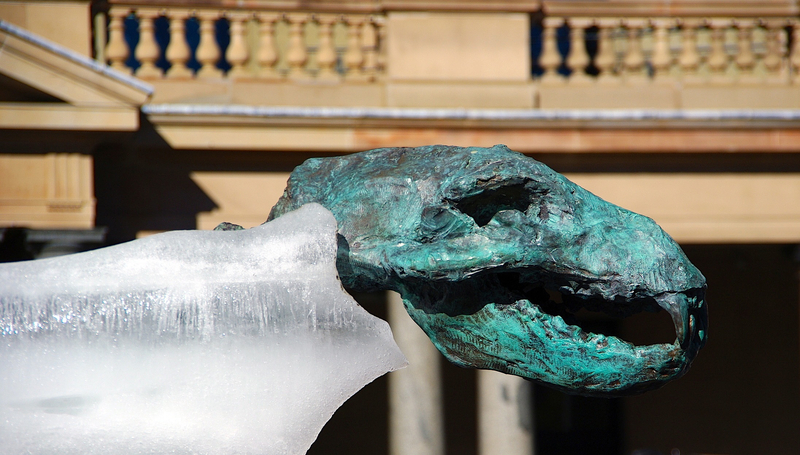 For his Ice Bear Project, the British wildlife artist Mark Coreth shaped an ice sculpture around a life-size, bronze polar bear skeleton. When the “flesh” melted, these bronze bones were revealed. 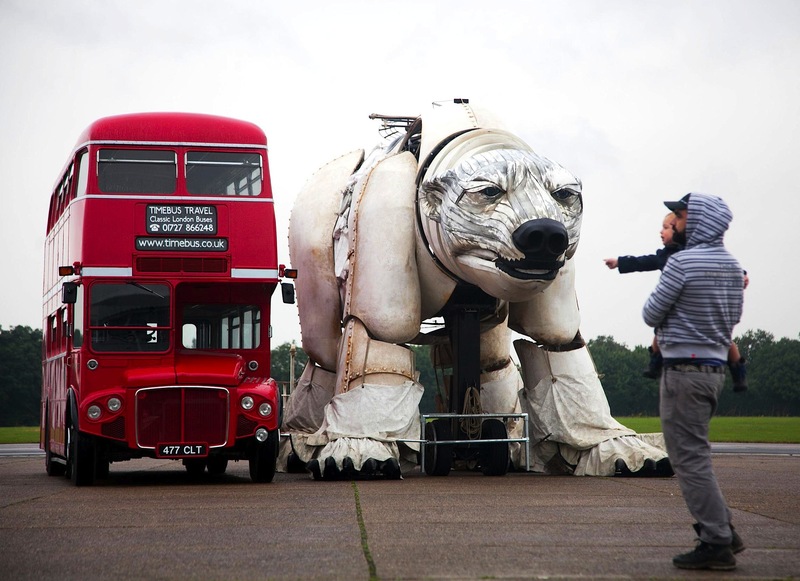 As part of a WWF climate change campaign, the installation premiered in Copenhagen in 2009 before traveling to London, Sydney, and Montreal. In 2013, thieves with a big rig stole the skeleton—worth twenty-three thousand dollars—from Coreth’s lawn. The police feared they would sell it as scrap metal to be melted down. Once again, a political statement had been gutted by greed, for animal parts to be turned into cash. Contradictions abound. Matters quickly get complicated. 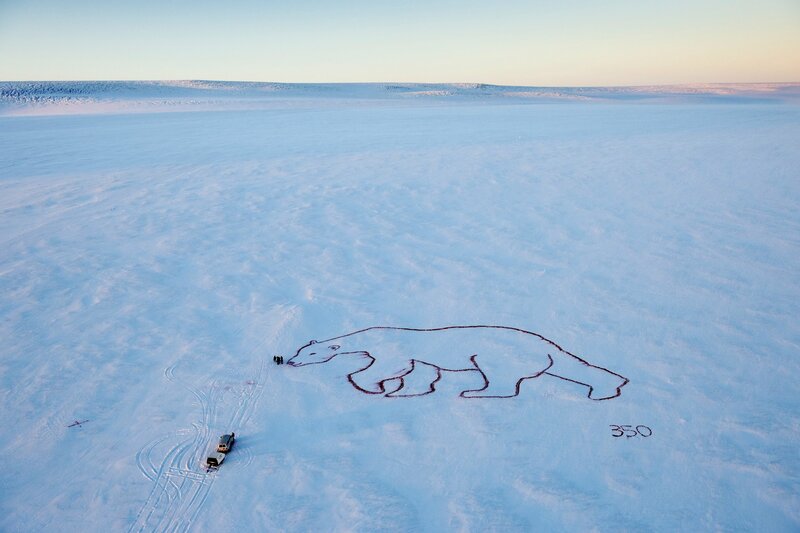 Inspired by the Nazca lines and children’s drawings, another Icelandic artist, Bjargey Ólafsdóttir, used organic red food dye to paint a gigantic polar bear outline on Langjökull Glacier, as part of a concerted e ort by artists and environmentalists to call attention to the 2010 United Nations Climate Change Conference in Cancun. It looked as if Earthlings had made a statement for extraterrestrials, showing them that they care about bears. Like ideas, artful images can change lives and even save some. In 2001, one of Alaska’s pro-development politicians raised a blank white poster board on the U.S. senate floor, like a modern-day Ahab poised for a strike. “This is what An-whar [ANWR] looks like nine months of the year,” he said, trying to sway fellow senators to open a refuge to resource extraction. 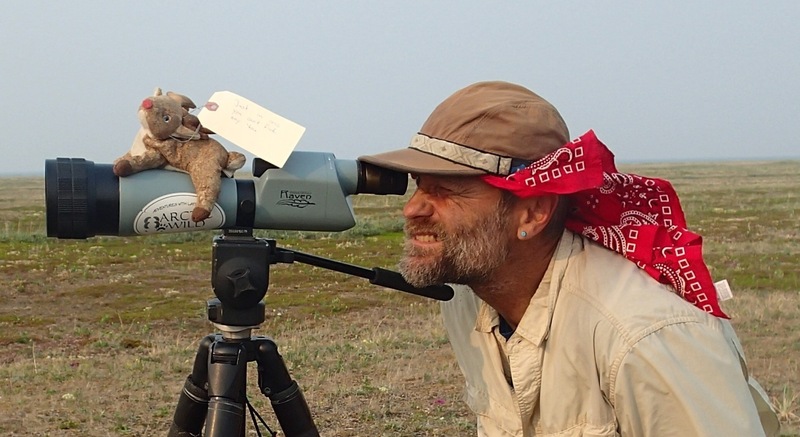 The Arctic National Wildlife Refuge he so decried has the highest concentration of polar bear dens in Alaska. 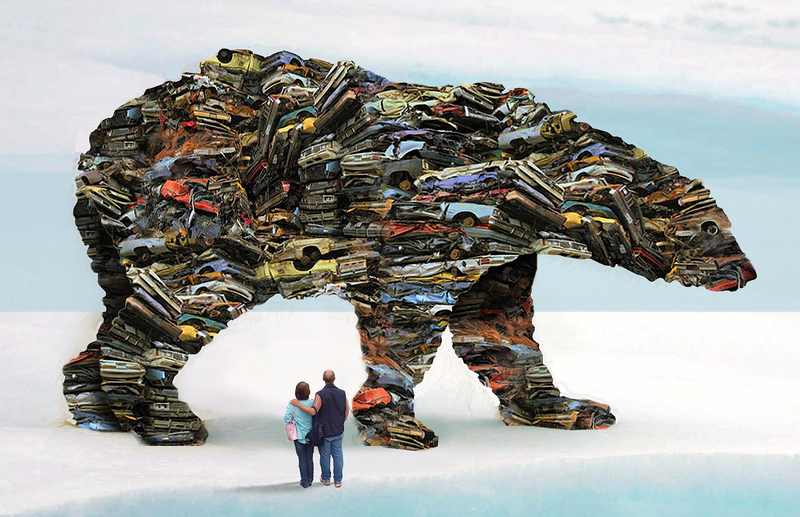 An opponent of drilling later held up a book with winter scenes by Subhankar Banerjee, of polar bears emerging from their dens in the alleged white waste. The refuge remained one, for the time being. 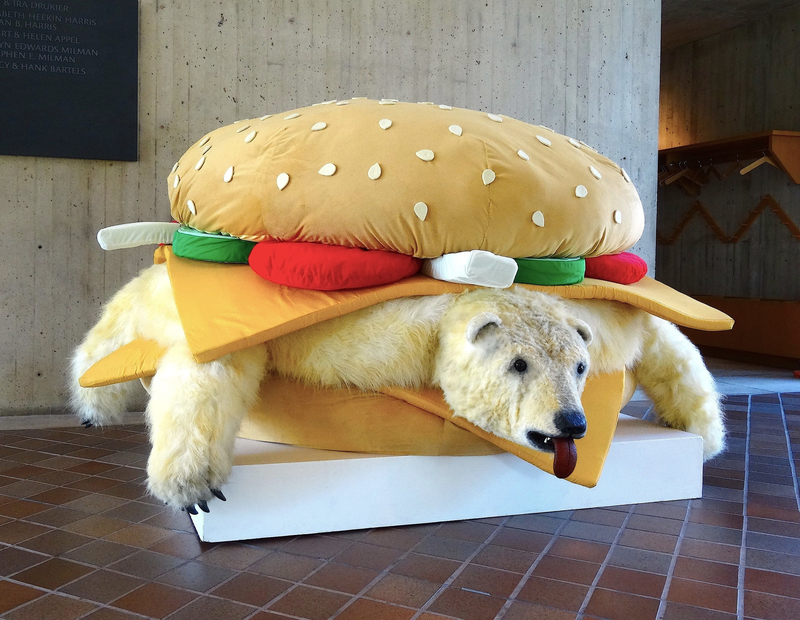 In the new millennium’s politics, polar bears thus play the part whales played in the 1980s. From a theatrics-as-protest perspective, their shape lends itself better to impersonation than that of a rainforest or whale. 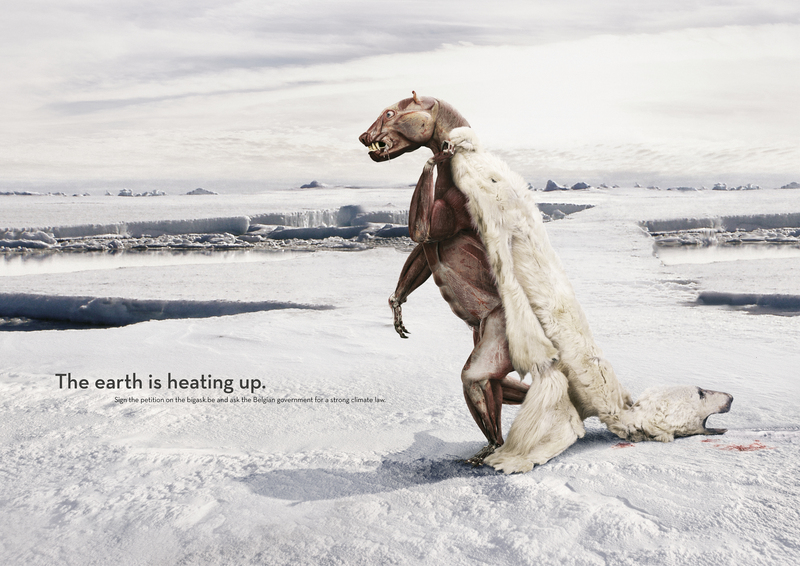 But Greenpeace activists are not the only people who wear fake polar bear fur to discomfort the public. With her one-woman show Ode to the Polar Bear, the Inupiaq rapper and performance artist Allison Warden provides an indigenous take on climate change and development. Drawing on stories and experiences of her elders, she mourns the animal’s passing and that of a way of life. During her monologue, she slips into various guises, including a polar bear’s, transcending human-animal nature as did the shamans of old. The many ways in which avant-garde artists employ the White Bear to question our society’s course and objectives prove its longevity as a symbol. Its role in this context is just one more we humans have assigned to this charismatic carnivore throughout the millennia. Let us hope only that the real animal will outlast these most recent representations.